John Ford's classic The Searchers is set in 1868 Texas. It is the story of an Indian raid that results in a little girl, Debbie, being taken captive. The story then follows her uncle, Ethan Edwards, and her adapted brother, Martin, as they spend five years searching for her. The movie can stand on its own as an exciting Western chase drama but it is so much more than that. It is about unconsummated love, racial hatred, revenge, miscegenation and search for salvation. 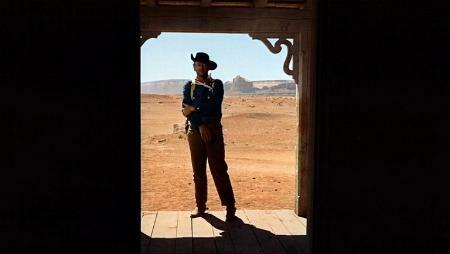 What makes The Searchers so special is the subtlety of it. John Ford made one hundred forty five movies and over half of those were silent. He was more effective using pictures than he was using dialogue to tell his stories. One of most important pictures in the movie shows Ethan and Martha in the background saying goodbye, as the Rev. Capt. Clayton grimaces uncomfortably in the foreground. Like the Victorian paintings in which a picture tried to convey a whole story, we have a lot of information being told to us in these few screen seconds. Martha, who is married to Ethan's brother Aaron, is obviously still in love with Ethan. This scene is pivotal in understanding the movie. It is Ethan's love for Martha which will drive him on his search for Debbie and it is his love for Martha which will lead him on the road to salvation. Another important picture that flashes across the screen for less than a second is the real keystone to understanding the movie (who else other than Ford would dare to do this?). As Debbie moves in front of a gravestone right before the appearance of Scar we can barely make out the gravestone's epitaph : "HERE LIES MARY JANE EDWARDS KILLED BY COMANCHES MAY 12, 1852 A GOOD WIFE AND MOTHER IN HER 41st YEAR." Ethan's mother had been killed by the Comanches. This event scarred Ethan and turned him into a virulent racist. Ethan was forced by his hatred to turn his back on civilization and on his love Martha, who ends up marrying his brother. When Martha is killed, Ethan must search for his niece Debbie, as much for his salvation as for hers. When the personification of his scar is killed and he raises Debbie in his arms, which reminds him of his love for Martha, he can finally begin the healing process. More than anything, The Searchers, is a story of redemption and healing. The crazed Confederate hero must overcome his racism and try to join the human race again. The movie was made in 1956, at the beginning of the civil rights struggle in America. Instead of addressing the issue directly, John Ford used a Western to comment on the current situation. It was a very daring movie to make. 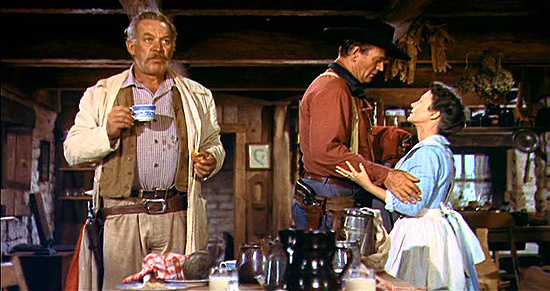 Having a hero who was a genocidal racist and shoots people in the back was different role for John Wayne and a different kind of movie for John Ford. At the end of the movie, Martin, the "half-breed" and Debbie, the "leavin's of Comanche bucks", are allowed to enter the homestead with the Jorgensen family. Ethan, the racist, turns away and again walks away from civilization. While the ending is far from a typical Hollywood ending, it is also not without hope. Ethan was saved by his love of Martha which allowed him to return Debbie home. At the end of the movie he was on the road to redemption. And John Ford bravely showed Americans that there no room in our households for the racist and segregationists. He said it with subtlety and he said it mostly with pictures, and he said it in 1956.